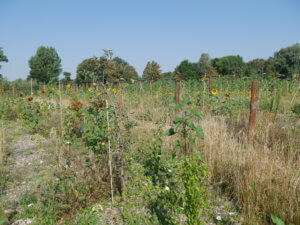 A food forest (syn. : ‘multi-layered agroforestry system’) is an agricultural system which is based on perennial (‘long-living’) crops such as fruit and nut trees and shrubs, mimicking a forest ecosystem. It works with the natural succession, species diversity and existing ecological niches for resilience and efficient capturing of sunlight energy. The species are selected to create a functioning agro ecological system, that produces human food at the same time. A wide range of products such as fruits, nuts, berries, vegetables, seeds, herbs, mushrooms, but also wood and other useful biomaterials can be obtained from a food forest. Food forest farming systems do not require any inputs in agrochemicals such as herbicides or artificial fertilizer. There is no need for heavy machinery that would compact and disturb the soil, instead, smart harvesting techniques are being developed. Overall the amount of fossil fuel required to produce food decreases with this system. This question has led to the development of the 1 ha experimental showcase food forest for ecosystem mimicking agriculture. 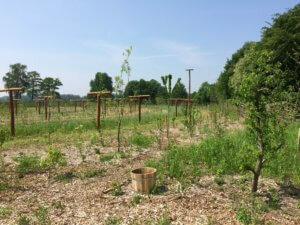 With the goal of creating an inspiring example and being a place for active learning, testing and exchange, all around the topic of temperate climate agroforestry systems. Today, about 3500 trees, shrubs and berries grow together with a few thousand beneficial herbs and other plants on a former cornfield. All together they form a forest edge ecosystem, one of the most productive zones in nature. 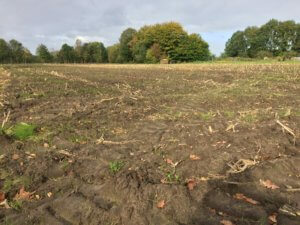 The food forest is still in its early years, and yet, there has already been some harvests from many different products. Over time, the food forest will supply: fruits, nuts, berries, vegetables, herbs, mushrooms, edible flowers and more. Not only does this food taste differently, it is also grown in a beautiful and inspiring environment which creates endless habitats, ecological niches and feed for many species of insects, birds and more. CURIOUS HOW WE DO THAT? By designing a diverse and complex food producing ecosystem, biodiversity increases, soil life is being build up, carbon is stored in the ground, the photosynthesis increases and due to the natural cycles, there is no need for chemicals, artificial fertilizer or heavy machines. These topics are being observed, discussed and researched at Den Food Bosch, in cooperation with our Partners. Check out our research programme to learn more. The food forest is not publicly open. During our tours and events, we are happy to share the story, the theory behind it, and most important, let you discover the whole system yourself!